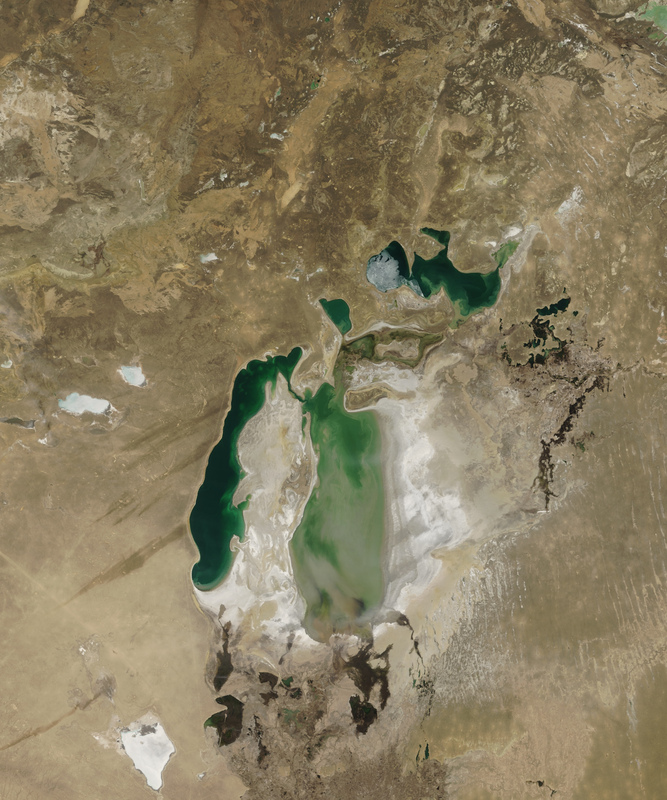 Once the fourth largest lake on Earth, the Aral Sea has shrunk dramatically over the past few decades as the primary rivers that fed the Sea were almost completely diverted for cotton farming and other agriculture. The decline of the sea has produced severe environmental, social, and public health problems. As part of a last-hope restoration effort, the World Bank funded the construction of a dam to separate the smaller, but less polluted and salty northern Aral Sea from the southern part. 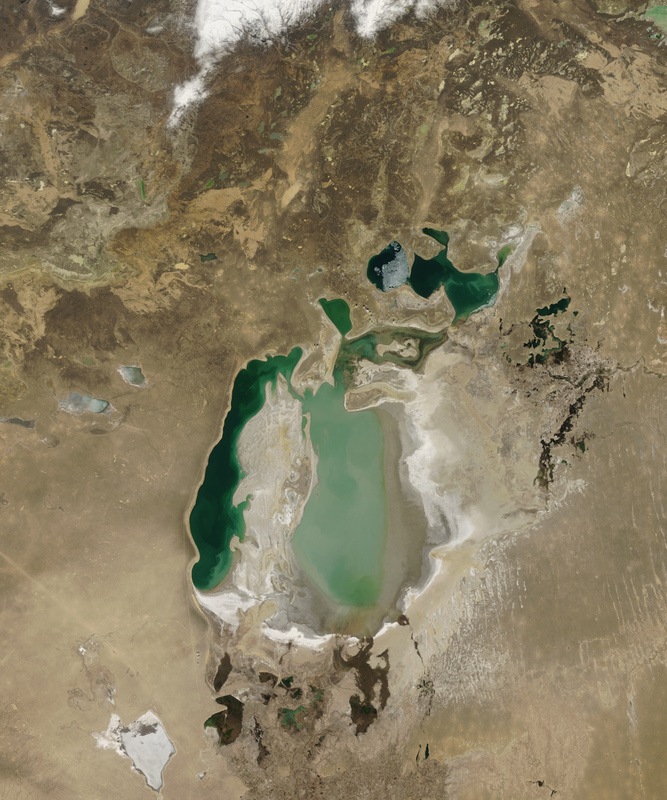 According to a recent article on the New York Times Website, since the dam’s completion in the summer of 2005, the northern Aral Sea has been filling up more rapidly than planners expected. 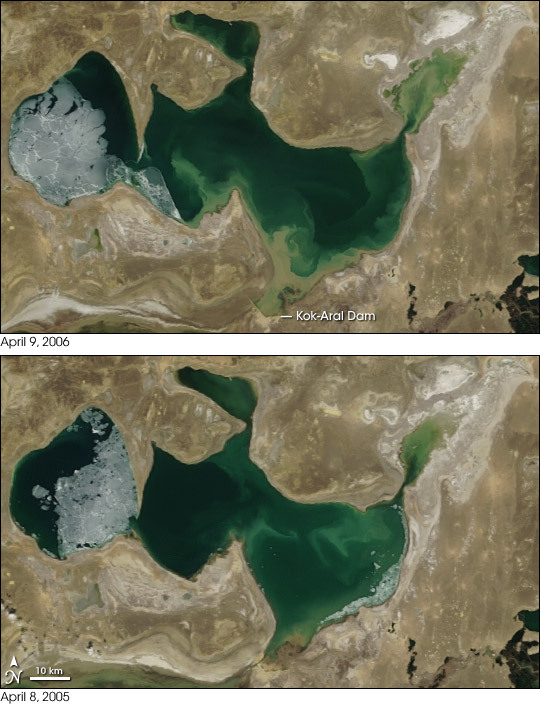 This pair of images from the Moderate Resolution Imaging Spectroradiometer (MODIS) on NASA’s Terra satellite shows the changes in the northern Aral Sea over the past year. The top image is from April 9, 2006, while the bottom image is from April 8, 2005. The most obvious expansion of the lake’s area is in the northeast, where a narrow channel from the main body of the lake connects to a widening pool of shallow, sediment-clouded water. The former shorelines of the lake appear paler brown than the surrounding landscape. A more subtle change is in the width of the channel that connects the main body of the lake to the lake’s most western part; the tip of the peninsula jutting down into the lake appears farther from the southern shore in 2006 than it did in 2005. Some ice remains at the western side of the lake in both images. A thinner strip of ice hugs the southeastern shoreline in the 2005 scene. At lower right in each image is the Syrdar’ya, the northern Aral Sea’s only tributary.